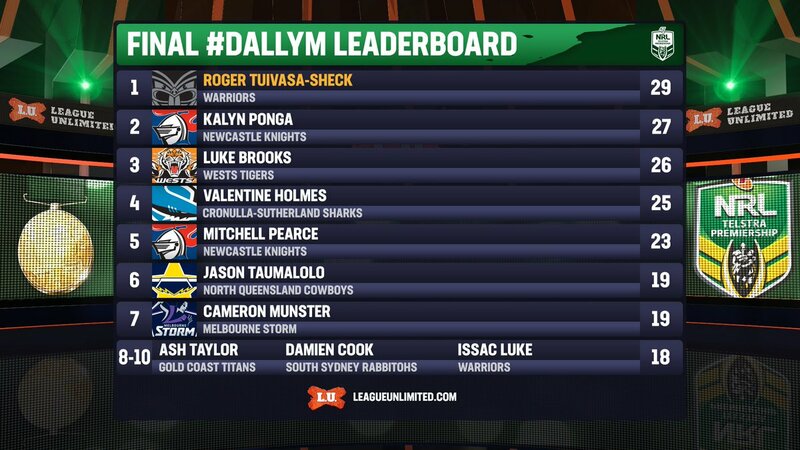 Warriors fullback and captain Roger Tuivasa-Sheck has taken til the last round to overtake Kalyn Ponga and claim the 2018 Dally M medal in tonight's ceremony at Sydney's Overseas Passenger Terminal. Check out below our coverage of the night including all the award winners and the Team of the Year. It all kicks off at 8:30pm! 8:30pm - We're underway! An opening montage to remember the career of JT and launch into the Dally M.
8:38pm - Rookie of the Year, the Peter Moore Award, to be presented by Kevin Moore. 8:41pm - Time to launch into the first part of the count. 8:45pm - After Round 16, Kalyn Ponga now leads on 22 points, ahead of Gareth Widdop & James Maloney on 17 points. Favourite RTS sits in seventh on 15 points. 8:49pm - Coach of the Year now, presented by Kevin Walters. 8:52pm - Captain of the Year, Walters still at the podium. 8:59pm - Sam Thaiday is on stage to attempt some comedy and honour the retiring players of 2018. 9:08pm - Hindy is on hand to present the Provan Summons Award (People's Choice). 9:11pm - Back to the count. Rounds 17-20. 9:15pm - Ponga retains his lead after 20 rounds with Brooks four points behind, RTS five. 9:20pm - It is now time to remember those who we've lost in the rugby league community over the past twelve months. 9:25pm - Tim Morrisey, the Telegraph's head of sport, is on hand for the Peter Frilingos Award for Headline Moment of 2018. 9:29pm - The Ken Irvine Award for the Top Tryscorer is now to be presented. 9:32pm - Rounds 21 and 22 up next as the Dally M count resumes. 9:36pm - Luke Brooks takes the lead! 9:38pm - Tarsha Gale takes the stage with the presentation to come for the Female Player of the Year, joined by Karyn Murphy. 9:51pm - We're no closer to knowing. Into Round 24 we go with Ponga back in front. 9:55pm - Team of the Year with CEO Todd Greenberg. 9:58pm - Round 25 and the Dally M coming up. ScoMo and JT take the stage. 10:01pm - Roger Tuivasa-Sheck is your 2018 Dally M Player of the Year!